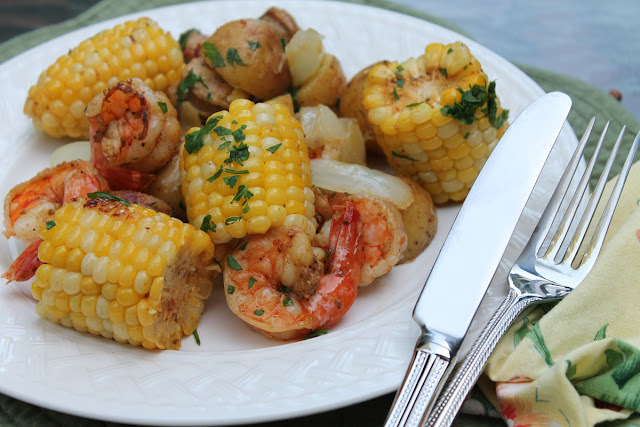 I've been obsessed with this Shrimp Boil Dinner recipe for the past six to eight weeks. It has been a perfect dinner for the grill, but it can easily be made in the oven. That means we can enjoy it all year long! I love it so much I decided it is time to share the recipe with you so you can become obsessed with it, too. There are so many reasons to love this recipe. The preparation time is short. You can pull this dinner together in less than 15 minutes. This is a one-pan recipe. There's no mess and no cleanup. Just throw your foil away. It takes 20 minutes to cook. You can make it on the grill or in the oven. That means you can have this shrimp dinner all year round. I usually make each of my foil packages with enough for two people. 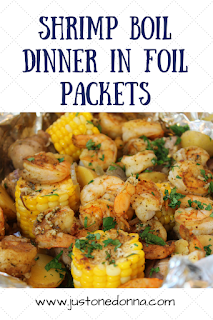 The recipe is written for one foil packet, to serve two adults. 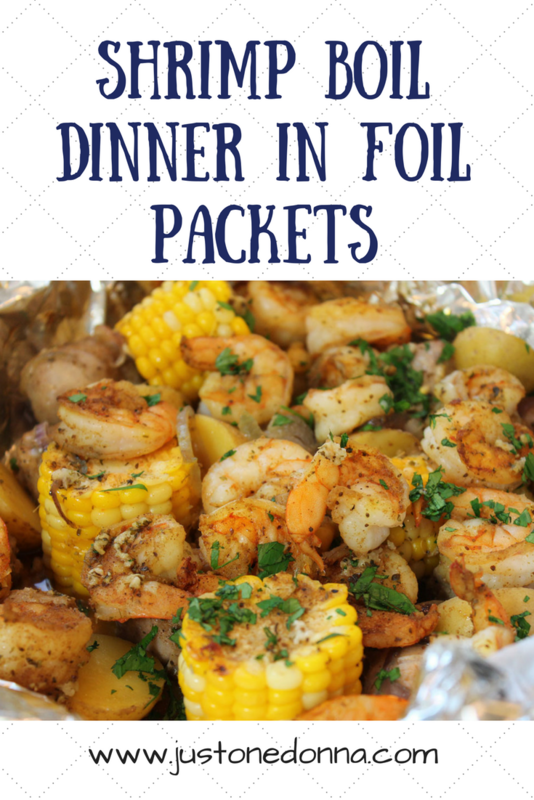 To serve four adults, double the ingredients and make two foil packets. To serve six adults, triple the recipe and make three packets. That's as complicated as this gets!! 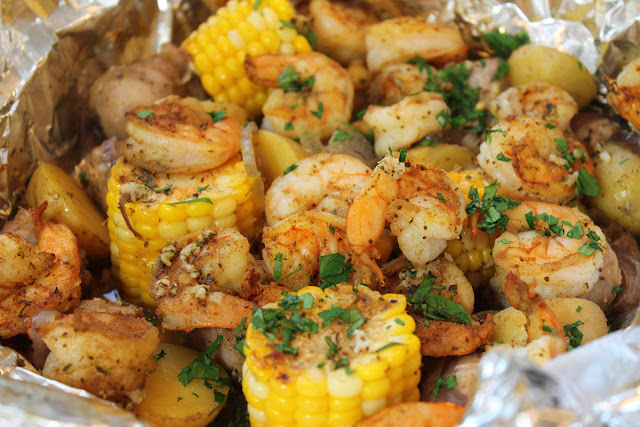 I like to add sausage to my foil packets for extra flavor and a contrast to the shrimp. You can use any kind of sausage you like. I've used both sweet Italian sausage and a chicken with jalapenos sausage in this recipe. Both were delicious. I prefer to use baby Yukon Gold potatoes in the recipe because they require very little preparation. They don't need to be peeled, so I just give them a quick wash and slice them in half and they are ready to go. Just know that you can use any kind of potato you want. If you use a large potato you will want to peel it and then cut the potatoes into 1-1/2 inch cubes. Turn on your grill or preheat your oven to 450 degrees F. Prepare your foil packet by cutting two pieces of foil, approximately 18 inches long. Lay the foil crosswise, one piece on top of the other. 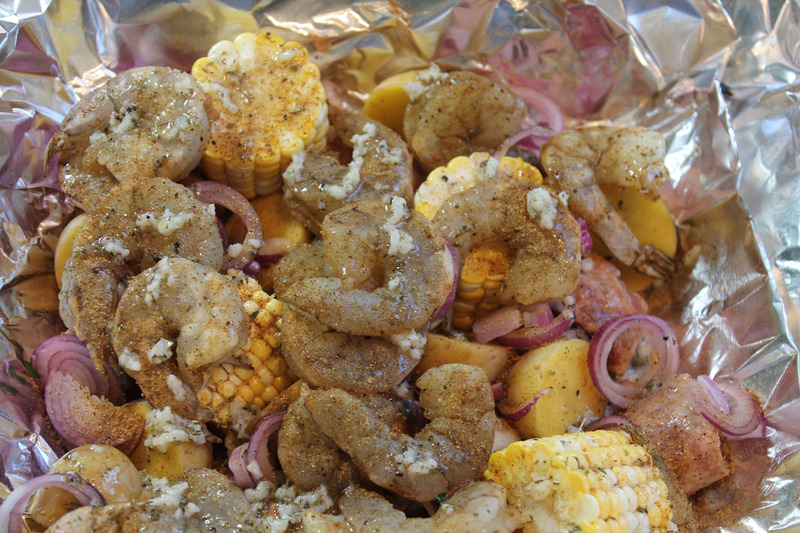 Place the shrimp in a bowl and sprinkle with one teaspoon of Old Bay seasoning. Toss to make sure the shrimp is well covered. Set aside. Melt the butter, lemon juice, and Better Than Bouillion together in a small bowl, stirring to mix well. Cut the onion into eight chunks. Place the onion, corn, potatoes, and sausage in the center of the foil. Pour the butter mixture over them. Sprinkle with the other teaspoon of Old Bay seasoning. Using your hands, toss the mixture to be sure the butter mixture and Old Bay seasoning are well distributed. (If you are not a fan of Old Bay seasoning substitute an Italian herb seasoning or a Creole seasoning.) Add the shrimp. Sprinkle with the chopped parsley. Seal one piece of the foil into a packet. Seal the other piece of foil over the first one. You don't want any of the yummy ingredients to leak out. Cook the packet on your grill or in your oven for 20 minutes. There is no need to turn the packet. Insert a knife into the potatoes to be sure they are cooked before serving. Serve hot. Shrimp is my favorite food! My husband knows the way to my heart is a delicious shrimp dinner. I'm so excited to try this easy recipe. It looks delicious! Thanks! It's one of my favorite dinners these day, Breeze. I hope you like it as much as I do. I'm doing this when my son and his girlfriend come out for the weekend. This is so much better than doing it on top of the stove. I don't think I will ever do it on top of the stove again. Thanks for the recipe. Yummy. I made a few alterations for my fam's tastes: I cut the corn off the cob and mixed it in, and instead of Bay seasoning I used Italian, lemon pepper and garlic powder. I did do it in the oven. It took over twice as long as the recipe calls for even with the potatoes cut very small and the sausage in small chunks. It was very good when it was done! I'll make it again for sure. I'm so happy you like this. As I said, it IS one of my favorites! I'm not sure why it took double the time to cook for you. Perhaps there is a difference in our oven temperatures. Regardless, this is a great recipe for a delicious dinner.